By Peter Anderson 15 Comments - The content of this website often contains affiliate links and I may be compensated if you buy through those links (at no cost to you!). Learn more about how we make money. Last edited October 25, 2018 . 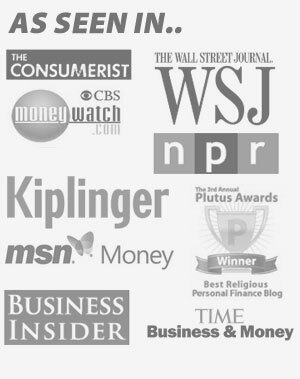 I‘ve been blogging about personal finance now for some time. During that time one person I've heard about time and again is Dave Ramsey and his baby steps. I've gotten a basic understanding of his program through posts that other bloggers have had on their sites, but I always wanted to delve a little deeper. A couple of weeks ago my wife and I got that chance. Some friends in our church small group decided that over the summer months they would be hosting a Dave Ramsey “Financial Peace University” class at their home every tuesday for 13 weeks. It sounded like a great chance to examine his ideas a little more in depth. We paid the $100 for the class and materials. 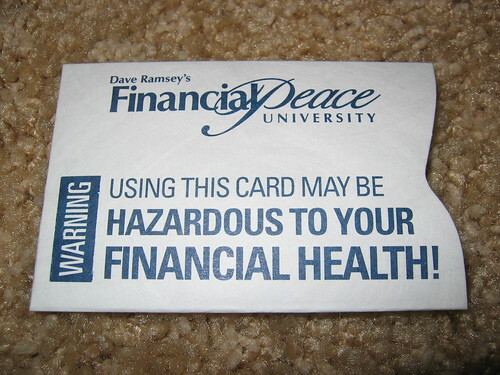 Opening The Financial Peace University Packet – What's Inside? We got our package this past week, and today I decided to do an unboxing of all the things in the box, kind of like they do with new tech gadgets on a lot of the technology sites. Inside you'll find audio CDs, CD-Roms, books, workbooks and more. 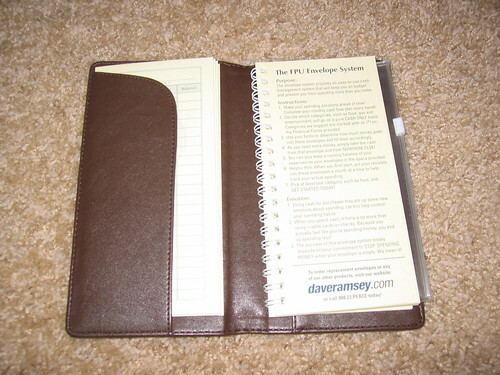 Although we'll be watching the lessons on DVD with our group, the lessons are also included on CD in a nice CD wallet. 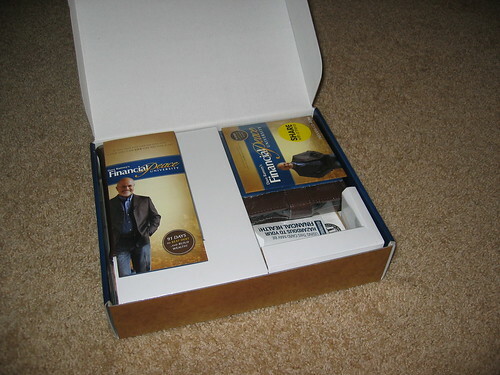 The package also includes a nice faux-leather wallet to use with the enveloping system. This promises to be a challenging thing to do for my wife and I. We're used to just paying our bills, and then saving/spending whats left over without any kind of an organized budget. Looks like we'll have to use a bit more discipline now! 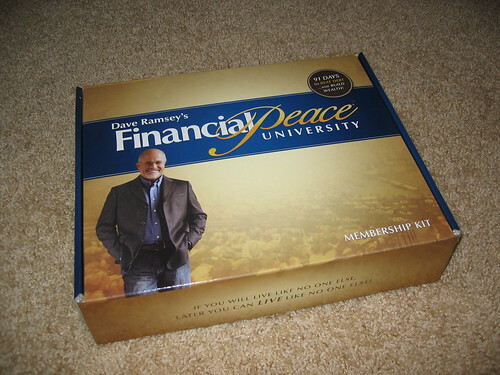 So there you have it, that is the unboxing of the Dave Ramsey “Financial Peace University” membership kit. Lots of great stuff, all of which we'll be getting into over the next 13 weeks. 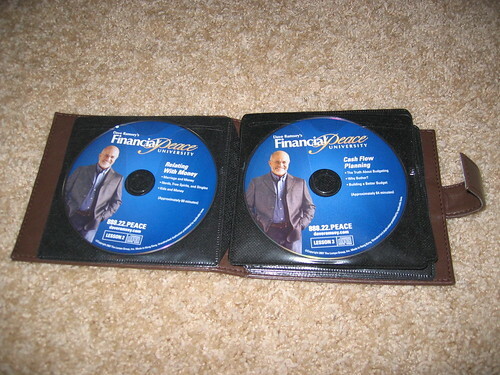 During our 13 week journey I'll blog about our experience with “Financial Peace University“, and update you on some of the tips that we get from the great mind of Dave Ramsey. Stay tuned for more! UPDATE: This kit is now outdated. 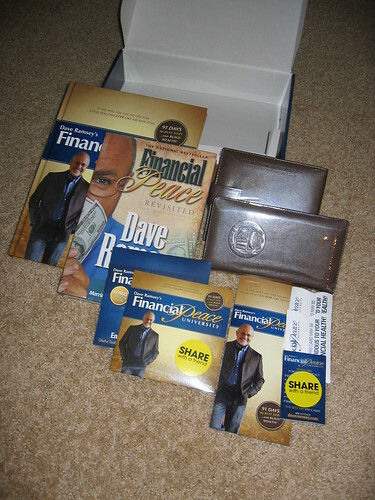 Click on the link to check out an unboxing video and photos of the new 2012 Dave Ramsey Financial Peace University Membership Kit. $100 seems a great value! $100 to take the class and get the kit. Well, I just wanted to mention that those sleeves are absolutely NOT for credit cards. They are for your debit cards – the ONLY plastic you should be carrying around in your wallet from now on. yup, i just mistyped that.. :) thanks for the clarification though – i’ll fix it. How many debit card sleeves does it come with? We might need more than one for our household. :) Our kit hasn’t arrived yet, but we’re looking forward to picking it up on Sunday. If I remember correctly, it comes with just the one sleeve. Is it just him talking or him live in a crowd? Is it entertaining? It is Dave Ramsey talking in front of a live crowd. It’s actually very entertaining as Dave Ramsey is very engaging and funny. We had a good time watching the videos. Oh I do know about the videos but whatabout the CD’s? Good morning, My name is Vida and I am writing this for my son Richard. This morning I told him a little about your program and you and I think it would be so wise for him to do this program with ;you. His question was when your Financial Peace packet arrives does your CD’s have cabtioning for the deaf? Also, how would he be able to get any questions answered if he does not understand something on the CD? He has been handed a huge blow two weeks ago that his wife of six years has decided that she does not love him anymore, wants our of the marriage. I am here only for another two days and I myself am in shock of what she has said to me. I had asked for them to go to guidance councillor but it seems she had already make up her mind and only lwent for a few sessions to make sure that someone was there to tell him of her decision. There are two little ones involved a little girl 5 and a little boy 3. I really lthink he will benefit from your teachings but because I am so far away I know he will need help in a lot of ways. He has been laid off his job where he is an auto body specialist and he will step up his search for a job but now it will mean selling his home and moving. All of us in the family are living in Ontario as he is living in BC. So, in conclusion please let us know if the course would offer him help in captioning for the CD and so on. We would be eternally grateful. Yours sincerely, VIda Verbickas. This is something that needs to be taught in school starting in the 6th grade. I’m over 50 and just now learning this… How much money and time have I wasted? The Buck Stop Here!!! This works! 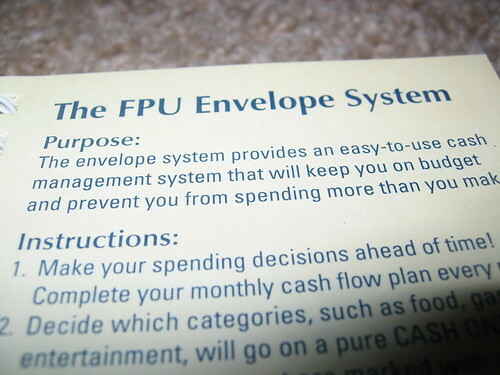 My wife and I purchased FPU in January of 2009 and followed it to the “T”. We are now on Baby Step 6! It has changed our lives. “Financial Peace brings Family Peace”. Go for it everyone!! Next Post: Drive Free Cars And Retire Rich!